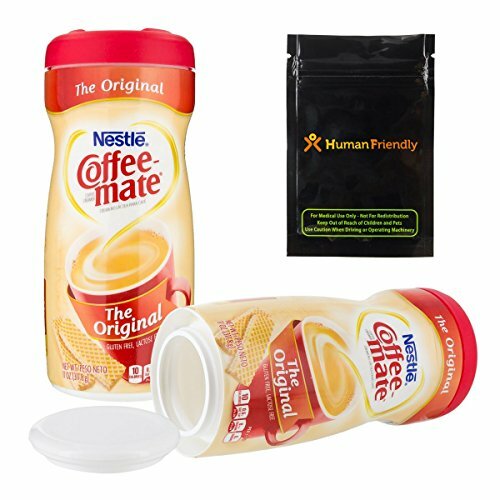 The Coffee Mate stash can is another popular household or office diversion safe. Indistinguishable from the real thing, the false bottom rim twists off to reveal the storage compartment hidden in the center of the can. This hidden safe is constructed from an authentic Coffee Mate Creamer can and features an unbroken factory-sealed top. Each can features the clever design of being weighted with actual powder to feel and smell like the real thing in case it is picked up or shaken. - Actual can dimensions measure approximately 9" high, 3" wide. For added security we have included a tinted HumanFriendly smell-proof bag (measuring 3" x 4.5") to help keep your valuables even more secure. Having extra padding inside of the hidden compartment helps muffle the sound of anything moving around inside. PLEASE NOTE: Given the larger area of hiding space, we would recommend adding some extra padding around heavier valuables. AUTHENTIC - Made from a real 15 oz Coffee Mate Creamer can. This stash can is great for hiding valuables in your bathroom, kitchen or household/office cleaning cabinets. WEIGHTED WITH REAL POWDER - The can is cleverly constructed to be weighted with actual powder. When this stash can is picked up and shaken, it feels and smells like an actual can of creamer. HIDE YOUR VALUABLES in plain sight with this popular stash can. Having an extra can of Coffee Mate in your kitchen is extremely discrete. Nobody would suspect that your valuables could be hidden inside. HIDDEN COMPARTMENT is accessed by unscrewing the false bottom aluminum lid. The top holes of the stash can are covered with the factory-sealed label. INCLUDES 3" x 4.5" HumanFriendly smell-proof bag to keep your valuables even more safe and secure. Having a bag inside helps to keep hard items from clunking around. If you have any questions about this product by HumanFriendly, contact us by completing and submitting the form below. If you are looking for a specif part number, please include it with your message.